HMH Books for Young Readers, 9780547738499, 416pp. Although she’s an orphan in indentured servitude, sixteen-year-old Jennifer Strange is pretty good at her job of managing the unpredictable crew at Kazam Mystical Arts Management. She already solved the Dragon Problem, avoided mass destruction by Quarkbeast, and helped save magic in the Ununited Kingdoms. Yet even Jennifer may be defeated when the long-absent Mighty Shandar makes an astonishing appearance and commands her to find the Eye of Zoltar—proclaiming that if she fails, he will eliminate the only two dragons left on earth. How can a teenage non-magician outdo the greatest sorcerer the world has ever known? But failure is unacceptable, so Jennifer must set off for the mysterious Cadir Idris in the deadly Cambrian Empire—a destination with a fatality index of fifty percent. With the odds against them, will Jennifer and her traveling companions ever return to the Kingdom of Snodd? Jasper Fforde is the internationally best-selling author of the Chronicles of Kazam, the Thursday Next mysteries, and the Nursery Crime books. He lives in Wales. "Fans of strong, brave, intelligent females will root for Jennifer and her gang, and wait impatiently for the next book." "Fans will laugh all the way to the last page and will be happy to hear there is more absurdity to come." "Jasper Fforde’s “Dragonslayer” series is creative, hilarious, inventive, entertaining, and all-around bloody fun." "This third book in The Chronicles of Kazam series displays dynamic plotting, unforgettable characters, innovative writing, and cheeky humor, making this a fine addition to any library’s fantasy collection." 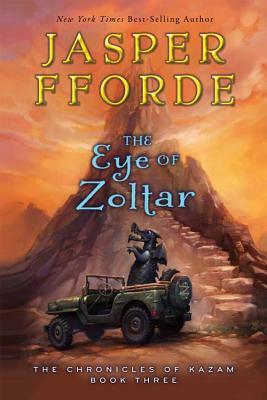 "Fforde’s comic genius is such that he can poke fun at fantasy’s generic tropes (“A quest always demanded the death of a trusted friend”) and, at the same time, make them work for him. Thoroughly satisfying."